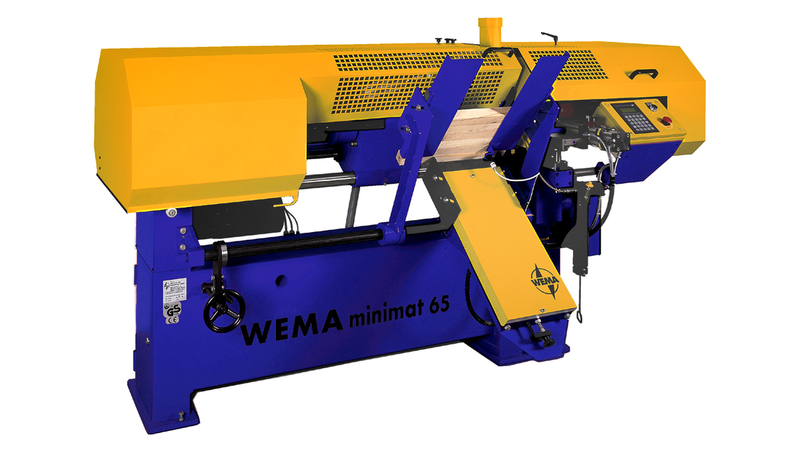 The WEMA Minimat 65 CNC is a fully automatic lathe for mass production of turned wood parts up to a diameter of 65 mm. The machine is equipped with two CNC controlled turning supports. In addition, it has a CNC-controlled wood material delivery, pneumatically controlled drilling support and pneumatically controlled parting support. The two turning supports can be used with either form steels (profile blades) or copying turning tools. Thereby it is possible to work traditionally with two opposite profile blades. It is also possible to use a combination of turning tools and profile blades or to use two, optionally three different copying turning tools. This flexibility allows a high variety of workpiece geometries. The assembly of the turning supports directly behind the steady rest guarantees excellent turning quality. The WEMA Minimat 65 CNC is characterized by high efficiency in large series and also smaller quantities. Even individual pieces or test parts are efficient and fast to produce. The supports are programmed via a CAD / CAM system. As blanks square or round bars can be used, which are supplied via a magazine.